As the supine press ponders whether there will be mission creep orÂ whether Congressional reaction to this immoral LibyanÂ war is motivated by morality or realpolitik, none has chosen to comment on the reckless deleterious impact of the Libyan crusade on nuclear weapons proliferation. Libya, unlike Israel that receives US bombs as gifts not as targeted victims, signed the Nuclear Non-Proliferation treaty (NPT)Â in 1968 and ratified it in 1975. Israel has neither signed norÂ ratified the treaty and continues to develop nuclear weapons in direct contravention of the treaty that all but four nations have ratified. Israel, India and Pakistan are the nuclear pariah states and the Democratic People’s Republic of Korea (DPRK) has left the NPT under its “supreme interests” clause. In 2003 Libya agreed to abandon, dismantle and accept full International Atomic Energy Agency safeguardsÂ in return for normalisation of relations with the US, the removal of sanctions arising out of the Lockerbie air disasterÂ and greater access to capital markets. Four sites near Tripoli were opened to I.A.E.A. inspections. While Libya, unlike South Africa, had no nuclear weapons to dismantle, they were probably about three to seven years from deploying a “crude” fission device. They had little reason to believe they would be attacked by those same powers that so hungered for their denuclearisation. The New York Times reported that the Democratic People’s Republic of Korea noted that Libya’s agreement to abandon its nuclear infrastructure made it more vulnerable to attack. The DPRK, the latest member of the growing nuclear club, has been the object of sanctions, threats and international calls for surrendering its nuclear ambitions and destroying its atomic-bomb inventory. The DPRK has not been attacked even after attacking the Republic of Korea. Indeed developing states that feel significant external threats to their power and nation, can see with great clarity that the major westernÂ nuclear powers do not attack nuclear states. The wrong lesson is being learned because it is tragically so right. Possessing nuclear weapons maybe a deterrent from a first-strike attack and ironically even more significantly a deterrent from conventional attack. 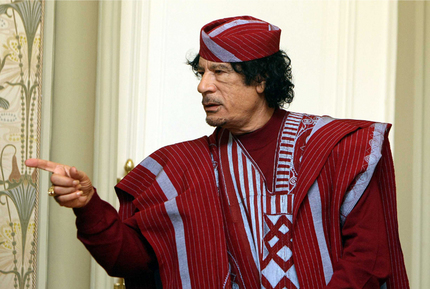 Would US warplanes kill young Libyan soldiers if Colonel Gadhafi lorded over a nuclear infrastructure? I doubt it. Warmongers such as the arrogant Secretary ofÂ StateÂ Hillary Rodham Clinton, who fantasised being attacked in Kosovo, and Ambassador Susan Rice, lust for combat and killing as long as they are far away from the baby-killing agony. Would these war criminals have succeeded in persuading PresidentÂ Barack Hussein Obama to attack a nuclear-weapons state in North Africa? I doubt it. States with nuclear ambitions take note: nuclear proliferation while devastating to the health of the planet may well preserve the national sovereignty of your nation. The madness and criminality of the Libyan crusadeÂ extends well beyond access to their pure, sweet crude. It is the message that horizontal proliferation of nuclear weapons, not its abandonment, is proven protection for a developing, weaker nation-state from the murderous imperialist ambitions of the United States and its N.A.T.O. subalterns. This entry was posted in External Affairs. Bookmark the permalink.